Powered by the same type of engines used by Boeing 747s, the aircraft is designed to take off at a maximum weight of 1.3 million pounds (589,676 kilograms). Its twin fuselages — sort of the airplane equivalent of a catamaran — are 238 feet (72.5 meters) long. The previous wingspan leader was Howard Hughes’ World War II-era eight-engine H-4 Hercules flying boat — nicknamed the Spruce Goose. Surviving in an aviation museum, it has an approximately 320-foot (97.5-meter) wingspan but is just under 219 feet (67 meters) long. 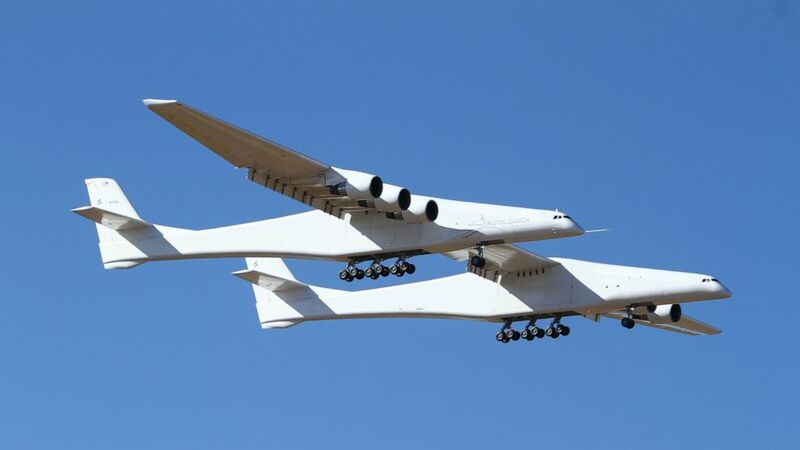 While Stratolaunch calls its aircraft the world’s largest, other airplanes exceed it in length from nose to tail. They include the six-engine Antonov AN 225 cargo plane, which is 275.5 feet (84 meters) long, and the Boeing 747-8, which is just over 250 feet (76.3 meters) long.